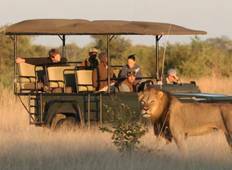 Find the perfect Safari holiday in Matopos National Park. There are 17 Matopos National Park safaris to choose from, that range in length from 9 days up to 73 days. The most popular month for these tours is September. "Great guides and drivers on the trip. Very few problems with anything (only one minor..."
"Amazing. Company was great and had the time of my life :)"
"I did the 30 day tour With Phillipa and our driver Stephen. It was truly the trip..."
"The tour to Zim, Botswana, Namibia and South Africa was absolutely amazing. We were..."
"My wife and I spent wonderful time with Absolute Africa. All of crew and people were..."
"Amazing time in africa and vailet peters is the best tour guide ever - very informative,..."
"Life Changing!! An amazing experience; beginning to end! Would recommend to anyone..."
"Absolute Africa was an amazing company to go on a long trip with, they are well organised..."
"One of the best trips of my life. 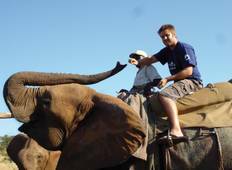 Absolute Africa have been doing overland trips..."
"Awesome trip n experience of a life time!!!! Unforgettable experiences from nights..."
"My experience with Absolute Africa has been nothing short of amazing, from the booking..."
"Down to earth company whose hearts really are in Africa and everything they do there...."
"A 73 day overland tour, through a whooping 10 countries. Starting in Nairobi and..."
"Our guide was our mentor and friend and always put us first. She was very approachable..."